The legendary lives of the saints were, once upon a time, as famous as stories from the Bible itself. Throughout the Middle Ages, the lives of the saints were well known all over Europe and those stories were told and retold in all manner of religious art, from the tiny miniature illustrations in medieval manuscripts to the grand frescoes and monumental sculptures decorating the churches of Europe. While the cult of the saints is still of tremendous importance in the Catholic church, the Protestant churches have downplayed the lives of the saints. As a result, many people today may be baffled by the unfamiliar stories they see depicted prominently in Europe’s churches and museums. Take a close look at the painting: do you recognize the story? It is the legend of Saint Sylvester and the Dragon. Saint Sylvester was one of the early popes of Rome, who lived at the same time as the Emperor Constantine, who famously converted to Christianity. The legends of Saint Sylvester are closely entwined with those of the Emperor Constantine. 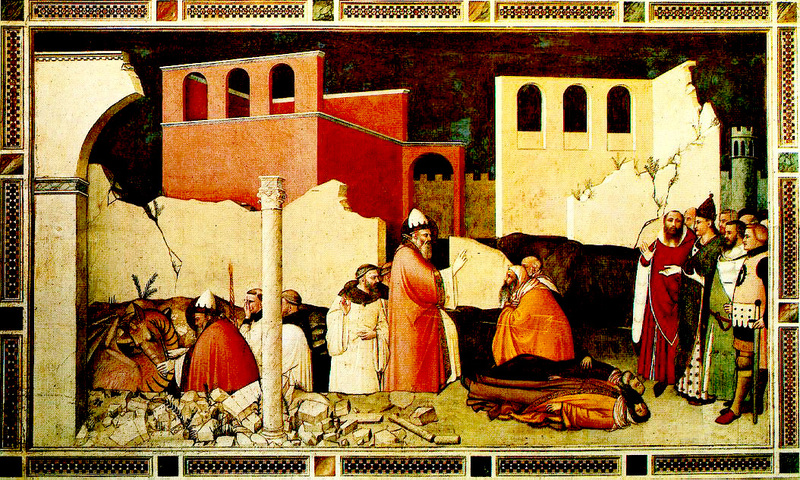 In addition to the story of Saint Sylvester and the Dragon depicted here, Maso’s cycle of frescoes in Santa Croce showing the life of Saint Sylvester includes paintings of the Baptism of Constantine by Saint Sylvester, Constantine and the Magicians, and the Dream of Constantine. In this time it happed that there was at Rome a dragon in a pit, which every day slew with his breath more than three hundred men. Then came the bishops of the idols unto the emperor [Constantine] and said unto him: O thou most holy emperor, sith the time that thou hast received Christian faith the dragon which is in yonder fosse or pit slayeth every day with his breath more than three hundred men. Then sent the emperor for S. Silvester and asked counsel of him of this matter. S. Silvester answered that by the might of God he promised to make him cease of his hurt and blessure of this people. Then S. Silvester put himself to prayer, and S. Peter appeared to him. This is the story Maso has told in his painting. As often in medieval and early Renaissance work, the artist depicts multiple events of the story in a single panel (see my earlier article on Aesop’s fables for more examples of this style of “simultaneous narration,” as art historians call it). So, to read this story, let’s begin from the far right. Here you can see the Emperor Constantine with whom the story opens and closes. The pagan priests have come to Constantine to tell him about the angry dragon, and the story concludes with their conversion, impressed as they are by Sylvester’s miraculous deeds. Meanwhile, on the far left, you can see Sylvester taming the dragon. Notice how one of his assistants is holding his nose. The dragon’s stink is a key motif in the story, and Maso di Branco has managed to convey that olfactory motif in visual form. Then, in the center, is the second miracle: Sylvester finds the two “enchanters,” or pagan magicians (Latin magi) lying unconscious on the ground, struck nearly dead by the stench of the dragon. By the power of God, Sylvester is able to raise the men up. As you read from the foreground to the background, you see the two magicians at first lying down, then rising up to receive the saint’s blessing. By juxtaposing the two narrative moments in this way (a marvelous example of simultaneous narration), Maso di Banco dynamically illustrates the resurrection of the stricken men. Although you might be surprised to see a historical pope depicted as a heroic tamer of dragons, Saint Sylvester’s exploit here is a typical Christian story of how God’s hero — or heroine — is able to defeat the monstrous serpent; similar stories are told in the Legenda Aurea of Saint Philip, Saints Simon and Jude, Saint Matthew, Saint George, Saint Margaret, and Saint Martha. The basic story of the “dragon-slayer” is one that Christianity shares with many other traditions as well, such as the Greek god Apollo slaying the Python, the Hindu god Indra slaying the serpent Vritra, or the Polish hero Skuba the cobbler slaying Smok Wawelski (“the dragon of Wawel Hill”), among many others. It is fitting that we take a moment to recall the legend of Sylvester at this time (in Issue 7 on January 1) because this saint has a special meaning for the New Year and our New Year’s celebrations. Historical accounts tell us that Sylvester died on December 31 in the year 335, and his “saint’s day” is thus celebrated on December 31. In many Catholic countries, New Year’s Eve is referred to as “Sylvester,” much as the name of Saint Valentine has become attached to the holiday of “Valentine’s Day” on February 14. In Poland, for example, on New Year’s Eve you celebrate “Sylwester” and the greetings that you exchange for the New Year are called “Sylvester Wishes,” Życzenia Sylwestrowe. In Italy, New Year’s Eve is called “La Notte di San Silvestro” (“The Night of Saint Sylvester”). So you may have already celebrated Saint Sylvester on New Year’s Eve — but if not, then remember to take a moment when the next New Year’s Eve rolls around and celebrate the heroic deeds of the dragon-taming saint when you pop the cork of your champagne! Happy New Year from Journey to the Sea ! Thanks for this article, Laura. Interesting read. Sorry to be getting around to reading it so late in the game. what a great story. am interested in finding out about this for my son as he shares his birthday on St. Sylvester’s feast day. i like the message of the story – rebirth. how fitting for New Years Eve. thankyou for a truely inspiring read!